please send me a free pen! This is the second time I’m to a free bic atlantis pen. I hope it happens. Yah I am not getting to lucky with it either! I love pens and ones that write very soft and thin! Denise, I got one by waiting about 30 seconds after the clock on my computer hit the top of the hour. I know theirs don’t kick in that fast, so if you wait just a short bit, it may work. Well it took almost a month, but today was the day, thanks SampleStuff.com and BIC!!! Hope I do get something free. Never happens for me. Can’t seem to get to where I need to register!!!! Could always use a good pen would really like to try one!!!! Can’t find the application for a free pen. i’ve used bic pens all my life and throughout my school years.a very good pen. This site doesn’t work. It tells me to “like” it, then when I click to enter, it tells me again to “like” it…but the “like” button is not there anymore because I already did that. Thank you , can’t wait to get them !! Takes a lot of clicking and liking to get this far. would like to try one of these pens. I use bic pens abut everyday and I love them. I need pens bic please!!!! 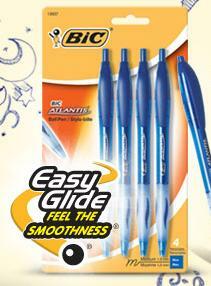 Bic is oviously the number 1 pen in America!